First time to Indonesia and find GOJEK logo around? Mostly you will find it on the helmet or jacket that being used by the bike /motorcycle driver. Is it a gangster? No! it is a transportation service that provide a ride (share seat) by the driver or motorcycle owner with other citizen (customer). How it works? How to use it? How to pay it? Is there any other service than share ride in Gojek? Here are the answers. In Indonesia a transportation service with a motorcycle is very common. In the big city like Jakarta the traffic is always crowded in most of the area, using a car or bus is very dangerous to hit by the traffic jam especially in the morning and after office hours. Even in the other region, the motorcycle service also common especially in area that so hard to handle by the car. Yup! Gojek basically is an app that connecting user that want to use the motorcycle service with the nearest driver (who own the motorcycle) so they will meet as soon as possible. This app also will calculate the price that you (as a customer) need to pay based on the distance (kilometer) between your current position (or pickup position) with the destination that you put in the app. The app available at App Store & Play Store. If you familiar with Grab or Uber Taxi then you will easy to understand how this Gojek App works. After you download this app from the app store or play store and you fulfills all the terms and registration (you need to provide email and phone number). 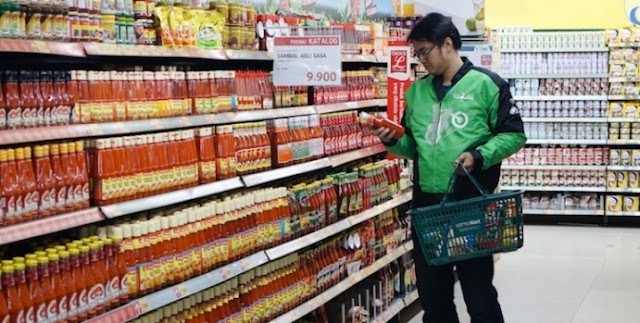 Gojek will start working when you open the app and start to choose the service that you want to use and get the destination target and pickup location. After you input the destination, the app will start to searching the nearest (registered) driver which available to drive you to the destination. The price will also appear after you put the destination location. There also ratting feature that you can use to rate the driver based on their service to you. Now they have so many service in delivery other than motorcycle transportation, but now we will use the transportation service with motorcycle. Let say you already have this app on your smartphone, Open it and choose ‘GO-RIDE’ or motorcycle logo, then you will asked to provide your destination location and pick up location on the blank fields. You can choose the payment method, with cash or with online payment (deposit). After you provide the destination and pickup location, the nearest and available driver will show on your screen and you can choose him / her to pick you up or not. After you agree with the driver, then driver will get the notification of pickup order, then the driver also could choose to take the order or not. Usually the driver will text or call to your number right after get the notification appear. They will make sure that you really order his service and also make sure the pickup location precisely. After you both meet, the driver will give you the helmet and masker (optional) to protect you from dust and polution. Sometimes they try to chit – chat along the way and that’s good as long as they keep concentrate to the road. After you reach the destination location, you need to give the helmet back but you can keep the masker. If you choose the payment method with cash you can give it to the driver now (after you reach the destination). Finally the driver will make a notification that you both arrive and after that you can rate the driver based on their service to you. Then you can close your app safely now. How to pay the service in Gojek? You can pay the service with 2 options in gojek, first you can pay with cash after you arrive in destination, and the second choice is with online payment like ‘gojek wallet’ but you need to make a deposit first. You can also give the driver bonus or additional fee if you like them or they treat you good personally. Is there any other service than share-ride in Gojek? YES! Now Gojek has expand their service to that related to transportation and also online transaction. Now Gojek also have transportation service with car like grab or uber and they call it as GO-CAR. You can also order the app to deliver something to someone without your accompany, like you asks your friend to deliver lunch for your husband in the office, they call it as GO-SEND. From transportation now gojek has service like delivery like food or anything that could be transport even like moving the entire house furniture because now they also expand their vehicle type from motorcycle driver to car or even truck driver, they call it as GO-BOX. From online transaction Gojek has also service to buy a ticket, they call it as GO-TIX. You can also order the driver to buy something in the market through the app, then someone will come to your place with your order and bill also, they call it as GO-MART. If you want to get massage, then they have service called GO-MASSAGE, if you want your house clean they have service called GO-CLEAN, if you want a pro make up service, they have GO-GLAM. And the other service that may come up along the time.